As a powerful Dragon, young Tomas Rios has always known he would be sought after by pirates and pirate-hunters, not to mention vile Shadowmen. His Dragon abilities allow him to command and give strength to ghosts of a race from the past, settlers of the city Atlantis. His abilities also allow him to heal others, so Tomas lives a quiet life in his grandfather’s apothecary shoppe. When an illness strains the relationship between a local tribe and the powerful order Draco Dominus, Tomas is called in to heal the afflicted. But as the negotiations go awry, Tomas must flee for his life and freedom. He accepts passage aboard a merchant vessel which is captured by pirates. Sworn to serve the captain and promised to a member of the crew, Tomas struggles to win the trust of the crew and learn to survive in their midst. A dark enemy sets his sights on Tomas as well. Shadowmen, eaters of human flesh, seek Tomas for the strength of his gifts. An uneasy truce may lie between them, but how long can such a deal last between men such as these? In a novel which blends fantasy with history, readers meet pirates on adventure in the high seas, hear tales of Sir Francis Drake, a Dragon himself in this telling, and glimpse the struggle between the Catholic church and Huguenots. Rather than large scaly lizards, Dragons are simply men (or women) who can bond with ghosts of the former settlers of Atlantis, who appear to have something of a more typical dragon-like form. These ghosts can animate objects but are usually otherwise invisible to human eyes. Chronicles of the Dragon Pirate is sort of Pirates of the Caribbean meets Eragon, moving through some heavily detailed narrative, peppered with intense action sequences. Tomas desires to live an honorable life, to be faithful in love, and to protect those who serve him. It is easy to admire such a man. Readers looking for romance may be disappointed, though, because from the outset the romance is sort of a given, leaving no question about whether or not the hero gets the girl. Because of Tomas’ nature as a Dragon, he will go into “heat” several times in his life, during which time, human females will be drawn to him like moth to flame. While this event is not depicted in the story, it is referenced several times. One captain, a woman with quite a sexual appetite, fervently lusts for Tomas, promising that despite their rather large age difference, he will learn to enjoy sharing her bed. Tomas falls in love with a girl who we understand to be bisexual, and while she promises to remain faithful where other men are concerned, she refuses to give up relations with women. As Tomas and his love approach their betrothal ceremony, their captain makes them promise not to have “carnal knowledge” of each other before then. The pair are mostly faithful, excepting a brief graphic incident when they venture to an isolated place away from captain and crew. Following the betrothal ceremony, another brief scene shows the couple consummating their relationship. The pirates look forward to visiting Tortuga to take up with easy women. Evil Shadowmen keep human females as pets, using them for torture and pleasure at whim. Characters and scenes reference these ideas, but no graphic descriptions occur. In St. Augustine, Tomas’s mother is shunned by clergy because of her past Huguenot beliefs. Tomas believes as he is taught by a Catholic priest, though there is some question as to whether Dragons are accepted into the church. A couple of characters pray the rosary in time of need. Several scenes show battle violence, including some graphic descriptions of death of or caused by evil Shadowmen. Some of the descriptions are pretty graphic. Most scenes are brief. What are pirates without their bottles of rum? (One captain at least, prefers red wine.) Hangovers seem to be a routine part of life, though the main characters do not over-indulge. 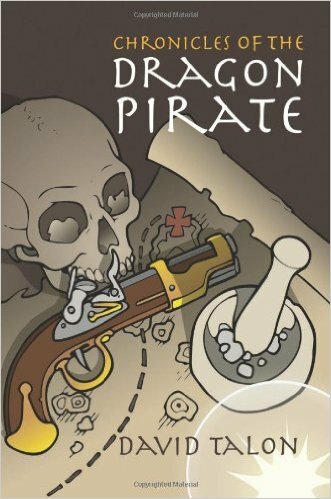 Tagged Chronicles of the Dragon Pirate, David Talon, Dragons, Pirates. Bookmark the permalink.